When And Where Do Typhoons Occur? These large tropical storms are known for wreaking havoc throughout the Northwest Pacific Basin. 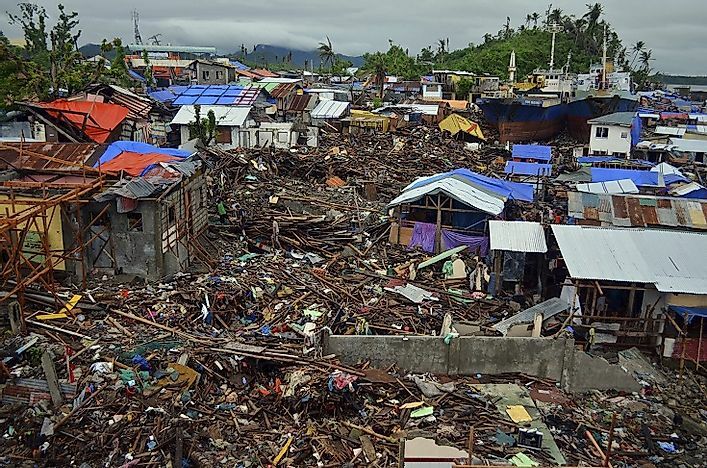 A demolished area of the Filipino city of Tacloban after being struck by Typhoon Haiyan in November of 2013. How Do Typhoons Form and Travel? Tropical disturbances forming over the warm tropical waters of oceans near the tropics lead to the formation of typhoons. As low level winds flow into the regions of such disturbances, these winds absorb moisture and energy from the ocean and rise upwards. The absorbed energy is lost in the form of heat, warming the air above the ocean. As warm air is less dense, it rises, and colder air from the surroundings is attracted into the void created by the rising warmer air. This air again absorbs moisture and energy from the ocean, again releasing heat as it rises up. Thus, a column of warm, moist air is created above the ocean, and this is known as a tropical depression. As the resulting drop in atmospheric pressure keeps intensifying, winds with ever greater speeds are attracted to the depression, and soon a tropical cyclone may be born. When the wind speeds at the center of such storms rise above a threshold value of 119 kilometers per hour, the storms are then officially known as typhoons. After they are formed, these typhoons tend to travel following either one of three types of paths: a straight track, a parabolic recurving track, and a northward track, each affecting any land that falls in their paths of movement. Areas or countries located near the warm tropical and sub-tropical waters of the world’s oceans and seas are most susceptible to experiencing the effects of typhoons. These tropical cyclones frequently originate in the northwestern Pacific Ocean, usually in the tropical seas around the Caroline Islands and the Philippines, and occasionally also arise from the South China Sea. Taiwan, Japan, the Philippines, and China are the largest countries that are most affected by typhoons. Although the U.S.A, India, and Australia also experience tropical cyclones, they are known by different names in those countries. Typhoons have claimed thousands upon thousands of lives on our planet since prehistoric times, and continue to do so in the present century. Though these storms are quite frequent in occurrence, some are more dangerous than the others. For example, Typhoon Ida, which struck Japan in 1958, resulted in around 1,269 human fatalities and damaged property worth $50 million USD. Typhoon Nancy of 1961 had possibly the strongest winds ever measured in a tropical cyclone, and claimed nearly 173 lives and left thousands injured. Typhoon Tip, which hit Guam and Japan on October 12th, 1979 with wind speeds over 305 kilometers per hour, killed nearly 100 people and damaged property worth millions of dollars. The deadliest typhoon of the 20th Century was Typhoon Nina, which killed 100,000 people in China in 1975, largely due to the intense flooding triggered by its heavy rainfall. One of the strongest and deadliest tropical cyclones of the 21st Century has been Typhoon Haiyan, which devastated large areas in Southeast Asia, especially the Philippines, as recently as November 8th, 2013, killing nearly 6,300 people in the Philippines alone. Typhoon Violet of 1961, Typhoon Sally of 1964, Typhoon Cora of 1966, and Typhoon Bopha of 2012 are others listing among the strongest typhoons on recent record. Scientists predict that the typhoons, hurricanes, and cyclones of the world are going to get worse. As the Earth warms up due to global warming and seasonal disturbances in weather become more common, the formation of tropical cyclones will be highly favored. Scientists claim that Typhoon Haiyan was an example of how typhoons are getting bigger and more threatening by the day. They also predict that, in the near future, countries like the Philippines might encounter more than 20 typhoons a year, with one or even two of them being potential "super typhoons". Also, as the periods between successive typhoons will become shorter, providing little time to the typhoon hit countries to recover, thus will result even greater damage to life and property from tropical cyclones than what has happened in the past. Though a reduction of the rate of global warming would be the only permanent solution to an increase in future threats from typhoons, it is also important for the governments of typhoon-prone countries to quickly devise new policies and disaster management plans to better handle the effects of these tropical cyclones in the coming years.